Tomato soup and grilled cheese sandwiches sounded good for lunch the other day. I got the soup started and was pondering our cheese options, and before I knew it, a relatively easy meal had gotten a French facelift. I’m not quite sure what to call what I made, but I’m pretty sure it is some sort of hybrid between a croque monsieur and a Monte Cristo. The latter actually sort of gives me the heebie jeebies, which makes the whole thing even more of a head scratcher. But whatever strange forces compelled me to combine Gruyere, prosciutto, Dijon mustard, an egg dip seasoned with herbes de provence, and a Parmesan crust, I hope it happens again—these sandwiches were awesome. Every element worked harmoniously, and I was seriously bummed that I only made one for myself. There are a lot of strong flavors in there, however—as much as I enjoyed the sandwich, it really benefited from the mild tomato soup to give my tongue some downtime. This is one of those method recipes; adjust for the number of sandwiches you want to make. 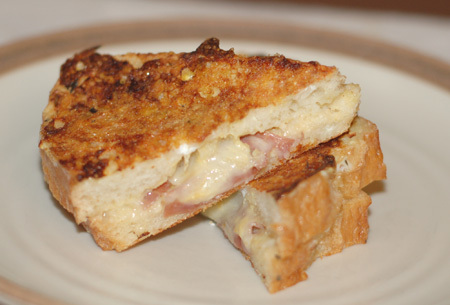 Slice the bread, spread lightly with Dijon mustard, and make sandwiches with Gruyere cheese and prosciutto inside. Heat up a non-stick griddle or large skillet over medium heat. Beat together eggs, milk, and herbes de Provence; dip each sandwich in the egg mixture on both sides, holding it together as you work. Sprinkle top half of sandwich with grated Parmigiano-Reggiano and press to adhere; place the sandwich cheese-side down on the griddle and press more cheese into the exposed top piece of bread. Grill on both sides until Gruyere is melted, Parmigiano-Reggiano is browned, and egg dip is set. Serve with soup!